The first-ever gas carrier from Qatar arrived in Poland on Friday to help the eastern EU member diversify its energy supplies and reduce its dependence on Russia. The Al Nuaman vessel carried 210,000 cubic metres (7.5 million cubic feet) of gas to the northwestern Polish port of Swinoujscie. “For the first time ever, Poland has received a gas delivery from the Middle East,” said deputy finance minister Henryk Baranowski. 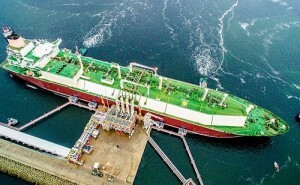 “As soon as the (Swinoujscie) terminal is launched, Poland will be able to import liquefied natural gas practically from any place in the world,” he added. The gas carried by Al Nuaman will be used for the technological launch of the Swinoujscie terminal, which should start commercial operation in mid-2016. Worth about 720 million euros, the terminal will have an initial capacity of five billion cubic metres per year, equal to one-third of Poland’s needs. Poland has recently upgraded its gas supplies system, building hundreds of kilometres of pipelines and underground storage facilities to boost its energy independence. In 2009, Poland signed a 20-year-deal with Qatargas on supplies via the Swinoujscie terminal.